The first flight of 1,000 Ethiopian olim (immigrants) approved by the Israeli government last year landed Monday February 4 in Israel. 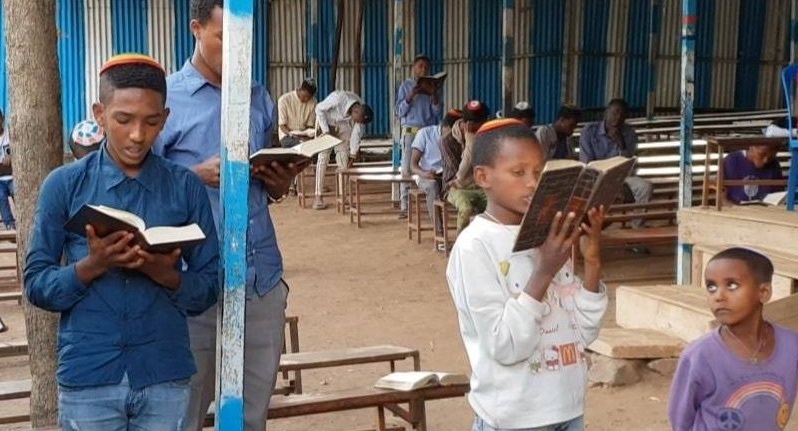 Pictured here: The synagogue in the Gondar camp where Ethiopian Jews are waiting to immigrate to Israel. In November 2015, the government decided to allow family reunification for the remaining 9,000 Falash Mura waiting for to move to Israel. Eighty Ethiopians will land at Ben-Gurion Airport on Monday – the first group of immigrants to come from the African country following the government’s decision last October to bring 1,000 members of the Falash Mura community with immediate relatives living in Israel. Upon arrival, a reception will be held at Terminal 1, where Jewish Agency for Israel chairman Isaac Herzog will welcome the immigrants. After receiving their identity cards, the olim will continue to the reception hall at Terminal 3, where their Israeli relatives will be waiting to greet them. The immigrants will then travel to absorption centers across the country operated by JAFI [Jewish Agency for Israel, which is supported by the Jewish Federation of Cincinnati] with the assistance of the Ministry of Immigration and Absorption to begin their new lives in Israel. In November 2015, the government decided to allow family reunification for the remaining 9,000 Falash Mura waiting for to move to Israel. By the end of 2017, about 1,300 had been approved and immigrated, and approximately 8,000 remained in Ethiopia. In October 2018, the government decided to bring another 1,000 members of the community who already had first-degree relatives in Israel.